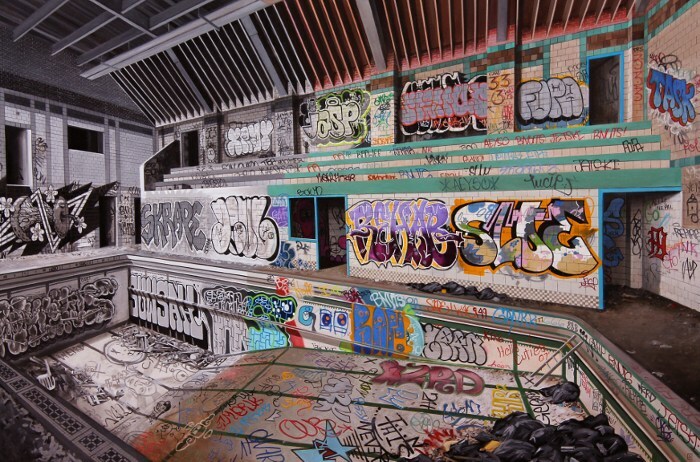 Jessica Hess is an American artist known for her hyperrealistic paintings of industrial wasteland covered with graffiti and street art. 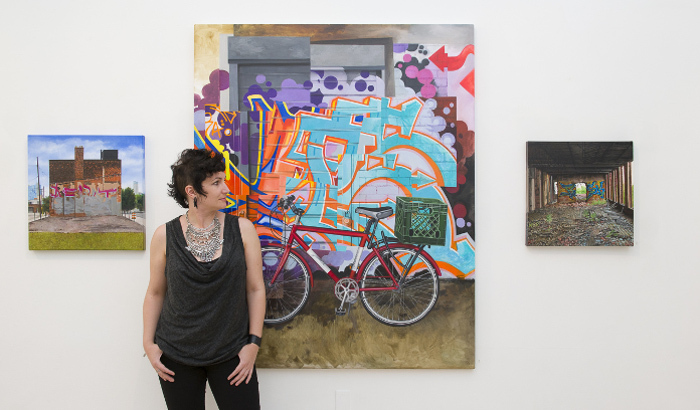 Born in Massachusetts and raised in North Carolina, Hess began painting her cityscapes in 2003 while she was attending the Rhode Island School of Design, a fine arts and design college located in Providence, in the U.S. state of Rhode Island, where she received her BFA in the same year. In the beginning of her career, Hess portrayed factories, power plants, and warehouses around Rhode Island, but without graffiti. 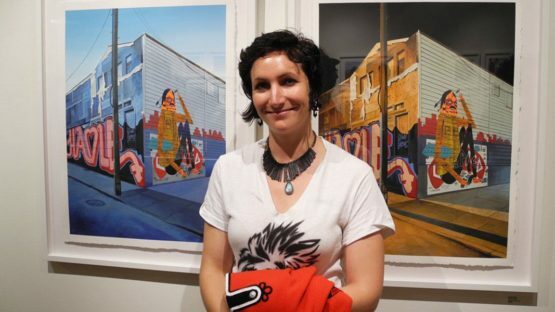 Eventually, she introduced street art into her paintings creating remarkably vividly realistic landscapes of graffiti covered urban environments. Using traditional and formal techniques such as oil, acrylic, and gouache, she recreates contemporary subject matter in such precise detail that you almost can’t believe you are looking at pieces. 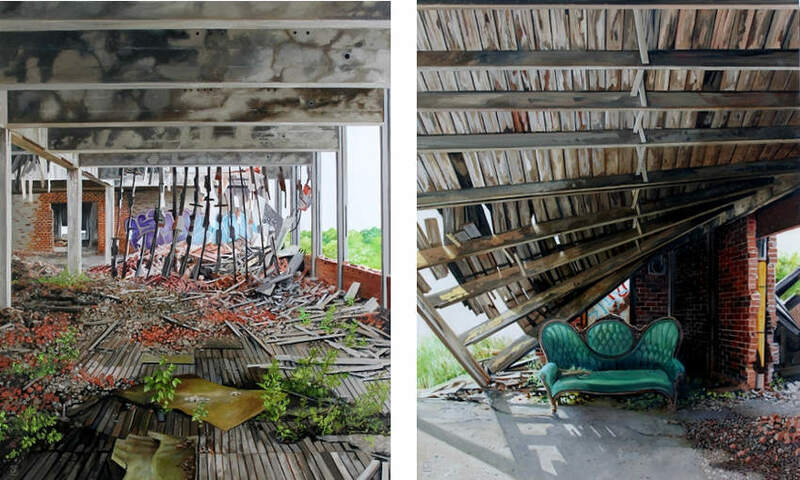 Her work develops from an accumulation of images and impressions of industrial and abandoned architecture. Armed with her camera, Hess searches through the urban landscapes of America, capturing graffiti laden walls and decrepit surfaces. She takes upwards of ten thousands photographs a year, which then serve as a basis and a starting point for many of her paintings. Hess depicts old and abandoned buildings, forgotten by all but the underground artists who uses the brick and concrete ruins as a canvas for their work. Hess’ art is focused on structure, simplicity, decay and subtle details of each location. Pointing out architecture’s imminent demise, she tries to give cityscapes a lighter perspective. The artist removes trash, cars, and people from her works, and these changes and exclusions make her landscapes more perfect versions of the actual city. In reworking and transforming urban landscapes in Hess’ oeuvre, the layers of the street are peeled back to reveal the starlets and icons of a time gone by. In her recent collection of realist oils, More is More, Hess made a move towards abstraction by adding an abstract element to her traditionally realist work. She has discovered her own art on a deeper level, composed of multiple abstract layers of meanings. Instead of removing them, the artist began embracing the “happy accidents” which would occur during the sketching process, so they could become new, exciting parts of her pieces. With this decision, her paintings got a deeply personal touch deriving from her own imagination, merging with realism of her actual scenery. Hess’ work has been included in many exhibitions all around the United States including at J Go Gallery, Park City, UT, Thinkspace Gallery, Culver City, CA, and Spoke Art, San Francisco, CA, among many others. She is the recipient of several awards, including the Trent Burleson Painting Prize, the Faber Birren National Color Award and the Stamford Art Association Award for Excellence. Jessica Hess’ amazing art has been featured in New American Paintings (Northeast #74) and was spotlighted in Harper’s Magazine and Broken Meter. She also illustrates for SF Weekly. The artist is represented by Hashimoto Contemporary and Spoke Art. Jessica Hess lives and works in San Francisco, CA, USA.